'Vibrant and illuminating ... [Dywer] tells a fascinating tale' The TimesThis meticulously researched study opens with Napoleon no longer in power, but instead a prisoner on the island of St Helena. This may have been a great fall from power, but Napoleon still held immense attraction. Every day, huge crowds would gather on the far shore in the hope of catching a glimpse of him. 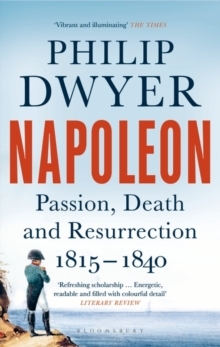 Philip Dwyer closes his ambitious trilogy exploring Napoleon's life, legacy and myth by moving from those first months of imprisonment, through the years of exile, up to death and then beyond, examining how the foundations of legend that had been laid by Napoleon during his lifetime continued to be built upon by his followers. This is a fitting and authoritative end to a definitive work.